Sorry, link no work. At least here it doesn't. Yes, link works, thanks. I like the one of the bowed RR tracks where it washed out. Is this on the old ADK line from Saranac to Thendara? Last edited by stripperguy; 03-12-2018 at 07:45 AM.. Looking through the older posts I came across your Milky Way shots. Stunning! What is your equipment? Thanks. 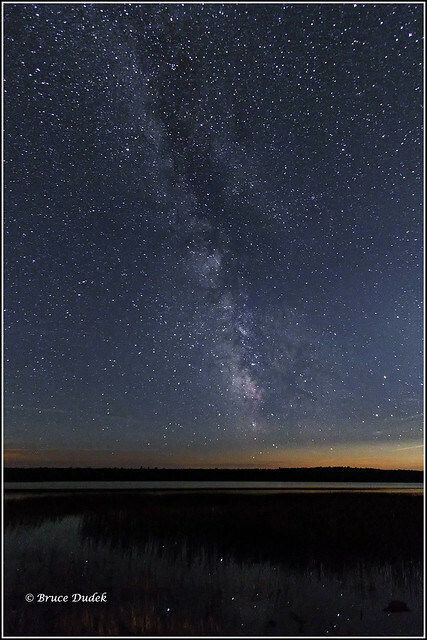 Milky Way Photography is challenging in the East. Always some light pollution, even in remote ADK locations. Snapping the image is not even half the battle. Good photo processing for Milky Way is complicated and I've not even begun to master it. But this one came out ok. Canon 7D2. Probably a 10-22mm lens. On a miniature tripod. Maiden voyage for my son's freshly built stripper...and yes, the ice was halfway out!! oh man!! What a great shot!!! Last edited by stripperguy; 09-07-2018 at 07:46 AM..
Lower Saranac Lake, Saturday evening Equinox 9/22/2018. My Happy Place in the snow. Trees are still green even in the winter. We rode sled past there . Impressive.